Parks311.com: Get a Seat near your Street! 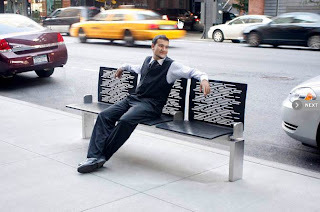 The CityBench program is an initiative to increase the amount of public seating on New York City’s streets. DOT is installing attractive and durable benches around the city, particularly at bus stops, retail corridors, and in areas with high concentrations of senior citizens. These benches will make streets more comfortable for transit riders and pedestrians, especially for those who are older and disabled. Anyone can request a bench. DOT encourages all New Yorkers to recommend locations for benches. 1000 benches are available, at least 500 of these are already applied for so if your interested in one for a location near where you'd like to sit in Chelsea, the sooner you fill out the form better.